CipherLab 9700 Series Equipped with Windows® Embedded Handheld 6.5 - CipherLab Co., Ltd.
Taipei, Taiwan - December 4, 2014- CipherLab is very excited to announce that the CipherLab 9700 series can run on Windows® Embedded Handheld (WEH) 6.5 alternatively now. With the addition of WEH 6.5 operating system, 9700 series enables the self-owned, custom development and off-the-shelf applications, which are constructed on Windows® mobile 6.x, to migrate as smoothly as ever. Thanks to the consistent SDKs and APIs, there would be no more worries or cost concerns for users on immigrating or re-developing software and utilities. Maintaining its excellent reading capabilities excelling within the four-wall environment, the device redefines versatility with its user efficiency. 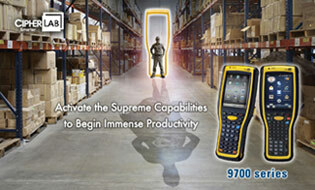 The CipherLab 9700 series is now ready to take on more demands and provide extra values for users. For more details and specifications regarding CipherLab 9700 series mobile computer or other CipherLab products, please visitwww.cipherlab.com. CipherLab is a global leader in the design, manufacture, and marketing of Automatic Identification and Data Capture/Collection products and systems. The company's mobile computers and scanners are integrated into the networks of some of the world's best known logistics, retail, distribution, government installations and healthcare companies, helping them run more efficiently and effectively onsite and on the road. Operating worldwide, CipherLab is headquartered in Taipei, Taiwan with offices in China,Germany and the USA, and is publicly traded on the Taiwan stock exchange (Taiwan OTC: 6160). For more information, please visit www.cipherlab.com.